Originally published in the Informanté newspaper on Thursday, 22 November, 2018. In about 4 days, a mission that was started on 5 May 2018 will reach its critical phase. On 26 November 2018, NASA’s newest Mars probe is set to enter the Martian atmosphere, and begin its ‘seven minutes of terror’, as it enters the atmospheric entry, descent and landing phase of the mission. For it to successfully land on Mars, it needs to hit the atmosphere at the exact right angle. During these seven minutes, the InSight probe will be travelling at almost 21 000 km/h as it enters the atmosphere. Its heat shield will increase in temperature to about 1 370 degrees Celsius, as the friction with the atmosphere brakes the spacecraft. After about 3 to 5 minutes, when it has slowed enough for the parachute to deploy. Thirty seconds after deployment, the heat shield will be jettisoned, and the onboard radar will be activated. This allows the craft to measure its speed and height above Mars. Then, 40 seconds before touchdown, it will jettison the parachute as well, and start freefalling, spinning away from the parachute and heat shield. Finally, just before it hits the ground, it will fire its rocket thrusters in preparation for contact and slow its speed. In those seven minutes, it would have reduced its speed from 21 000 km/h to just 8km/h as it lands on the planet, and thus successfully increasing the active robot population on Mars to two. Landing on Mars is hard, as only 40% of all missions sent to the red planet have been successful. All of these have been by NASA, and their recent missions have been quite successful. After the first Sojourner rover lasted just under three months on Mars’ surface, the next few far exceeded their operational lifetimes. In particular, the Spirit rover was planned to be operational for only 90 Martian solar days but lasted 2 269 days until contact was lost on 22 March 2010, while the Opportunity rover mission was also planned for 90 Martian solar days, and lasted 5 613 days before entering hibernation after a dust storm on 10 June 2018. As such, the Curiosity rover was designed for an operational lifetime of 668 Martian solar days and is currently on day 2237 of its mission – currently the only robot active on Mars. InSight, however, is something different, as its mission is not to explore the surface of Mars, but rather the interior of Mars. Its name is a backronym for INterior exploration using Seismic Investigations, Geodesy and Heat Transport (INSIGHT) which describes the instruments this Mars lander carries. Insight will take measurements of the inside of Mars, via seismology, heat flow and radio science. Why? Well, to tell us more about how planets were formed. While we’ve had ample opportunity to study our own planet, we’ve had no readings of the interior of other planets to compare it to. Mars and Earth seem like they were close to identical at one point in the past – about 3 to 4 billion years ago. Both were warm, humid, and covered in thick atmospheres. But in the time since then, these two took different paths. Essentially, this mission is trying to examine why Mars essentially stopped changing, while the Earth never stopped. The Earth developed tectonic plates that converge across the surface of the planet and allow new crust to emerge from the inside of the planet. This new crust brings along more than rock – it releases some gases which are vital to life, such as water, carbon dioxide and methane. Mars, however, does not seem to have tectonic plates, and InSight seeks to try and measure marsquakes for the first time to try and study its interior. Each marsquake will set off seismic waves that can be studied to illuminate the structure of Mars for the first time. Rocky planets also trap heat in their interior, either at formation, or via radioactive decay of elements over time. This heat could have been responsible for Mars’ early conditions, and its evolution into the red planet we know now. For this reason, InSight also contains a heat probe that will be drilled 5 meters into the planet, to try and discover how this heat shaped the planet. Heat also keeps a planet’s core molten, and as its metallic elements flow, they generate electric currents. On Earth, this results in a magnetic field around the planet, which not only aided us in navigating the planet by allowing equipment such as compasses to work, but also shields the planet from certain types of radiation. Mars, however, had a strong magnetic field once, but it seems to have dissipated. InSight therefore contains a radio experiment to detect the wobble of Mars’ axis, and via that, to learn more about the planet’s core, which in turn provide clues as to why its magnetic field disappeared. So with the dreaded ‘seven minutes of terror’ in sight, hopes are high that this mission will succeed. InSight could provide much insight not only into the early formation of our own planet, but also into what features to look for in extrasolar planets that makes them much more compatible to supporting life. The insights gained from this mission could dwarf those from prior missions, and we might finally have the first clues to point us towards extra-terrestrial life in sight. Originally published in the Informanté newspaper on Thursday, 15 November, 2018. Death can be a very philosophical subject, but for today, we’re going to take a look at the statistics behind death in Namibia. Specifically, we’re taking a look at the data collected by the World Health Organization’s Department of Information, Evidence and Research, and published in April 2018. This reveals the age-standardized death rates by cause of morbidity per 100 000 population. It reveals that the all-cause death rate for Namibia is 1 237 per 100 000 population, or to put it another way, that 1 in 81 people in Namibia will die each year. 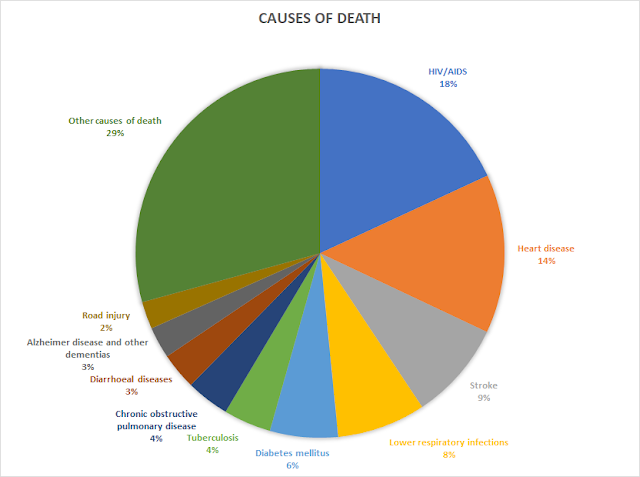 Subdivided further, it shows that non-communicable diseases are the biggest killer in the population, which will kill 1 in 149 persons, then communicable conditions that kill 1 in 209 people, followed by injuries, that kill 1 in 1 131 people. If we dig even deeper into non-communicable diseases, we find that the biggest killer in that category is cardiovascular diseases, which kills 1 in 317 people. In particular, the biggest killers are Ischaemic heart disease (where the blood supply to the heart is reduced) which kills 1 in 723 people annually, strokes which kill 1 in 935 people annually, and hypertensive heart disease (caused by high blood pressure) which kills 1 in 2 941 people annually. The second biggest killer in the category is malignant neoplasms (or cancers), which kill 1 in 1 332 people annually, but the cancers with the highest death rate are prostate cancer (1 in 10034), breast cancer (1 in 14982), cervix cancer (1 in 21 645), mouth cancer (1 in 21822), colon cancer (1 in 22685) and lung cancer (1 in 25803). The third biggest killer is diabetes mellitus, which kills 1 in 1359 people annually, with respiratory diseases fourth, killing 1 in 1492. Fifth is digestive diseases, with a death rate of 1 in 2667, with cirrhosis of the liver the biggest killer there, killing 1 in 8166 annually. Neurological diseases kill 1 in 2128 annually, with Alzheimer’s disease and other dementia’s claiming 1 in 2927 of Namibians each year. Let’s then dig deeper into communicable conditions. The number one killer in this category is infectious and parasitic diseases, which kill 1 in 300 people annually. It should therefore be no surprise to find out that in its subcategories, HIV/AIDS is the biggest killer, which deaths amounting to 1 in every 447 people in Namibia annually. Tuberculosis is a distant second, with deaths of 1 in 1937 people, and diarrhoeal diseases killing 1 in 2514 people annually. The second biggest killer here is respiratory infections, claiming 1 in 1039 people yearly, with almost 99% of those being lower respiratory infections. Third would be neonatal conditions, claiming 1 in 3386, with 1 in 7420 dying due to preterm birth complications. Next is maternal conditions, which kill 1 in 10868 annually. Finally, nutritional deficiencies result in the death of 1 in 11 064 annually, which 1 in 12763 being due to protein-energy malnutrition. Finally, we can take a look at injuries. Unintentional injuries kill 1 in 1732 people annually, with 1 in 3365 dying from road injuries suffered. Intentional injuries kill 1 in 3261, with interpersonal violence accounting for 1 in 5223 deaths, while self-harm accounts for 1 in 8685 death annually. So what other interesting statistics can we see when we take an overview of the data? Well, besides those causes which no Namibian dies from, the lowest causes of death are Thassaemias (where the blood does not produce haemogoblin) which kills 1 in 19 876 764, and eating disorders, which kill only 1 in 17 865 438. Also interesting is the fact that alcohol use disorders kill more people ( 1 in 42 128) and drug use disorders (1 in 45 820). When we take an overall view of the country, however, a clear picture emerges of the biggest killers in our nation. HIV/AIDS is the cause of 18% of deaths, with heart disease a close second at 14%. Strokes claim 9% of lives, with respiratory infections claiming 8% and diabetes 6%. Together, these diseases and conditions account for more than 50% of deaths in the country yearly. These are the numbers the life insurance companies use to calculate premiums, but more importantly, these are numbers that every citizen should be aware of. The old saying goes that being forewarned is forearmed. Ask your doctor about your risk factors for the biggest killers in Namibia, and you might be able to save your life, or the life of your child, or your parents. Every avoidable death is a tragedy. Originally published in the Informanté newspaper on Thursday, 1 November, 2018. With violence once again the rage in our nation, social media has been in uproar every time a new incident gets reported. Time and time again, the same refrain is repeated, “bring back the death penalty”, or “let him hang”, or “if I get my hands on him”. If you browse the comment section of every gruesome incident reported on by the Informante, you know this song, sung by supposedly moral and upstanding citizens of our nation. These cries are often done in the name of ‘justice’, yet they are in reality calling for vengeance. While the two terms may seem to overlap a bit, they do come from two entirely different places. Revenge is emotional, which is why the call of it seems so strong in the aftermath of a crime, but justice is primarily rational. Revenge is personal, while justice is impartial. Revenge is vindictive, while justice is vindication. Revenge fuels revenge, the classic cycle of violence as perpetrated by the mob; justice on the other hand, seeks to bring closure. Vengeance, ultimately, is about retaliation, expressing rage, hatred and spite, while justice concerns itself with restoring balance – restorative justice. Justice focuses on equity in punishment, in restoring the social balance that was upset by the crime. Revenge escalates, while justice seeks to redress an imbalance. Once the fervour of vengeance and religious certainty has subsided, only then do the proponents of the death penalty attempt more conventional arguments. Only now is it argued that the imposition of the death penalty will serve as a deterrent to future crimes of the same kind. Yet the facts do not support this. Firstly, a deterrent only works if it is consistently and promptly employed. With a criminal justice system that is run by people, we cannot claim that no errors will be made, and thus no court would allow for a quick execution after a crime until it has been properly examined. As such, executions are usually done quite a while after the commission of a crime, and has used a lot of court time and cost that could have been used to resolve other crimes. Secondly, a lot of these crimes that people call the death penalty for are not planned, but committed in the heat of the moment, under emotional stress, or under the influence of alcohol – when people are already unable to appreciate the consequences of their actions. When a crime is planned, part of that planning involves not getting caught, so the perpetrator has already considered the risk of being executed before committing the crime. Thirdly, if severe punishment can deter crime, permanent imprisonment is quite severe enough that it would deter any rational person from committing that crime. 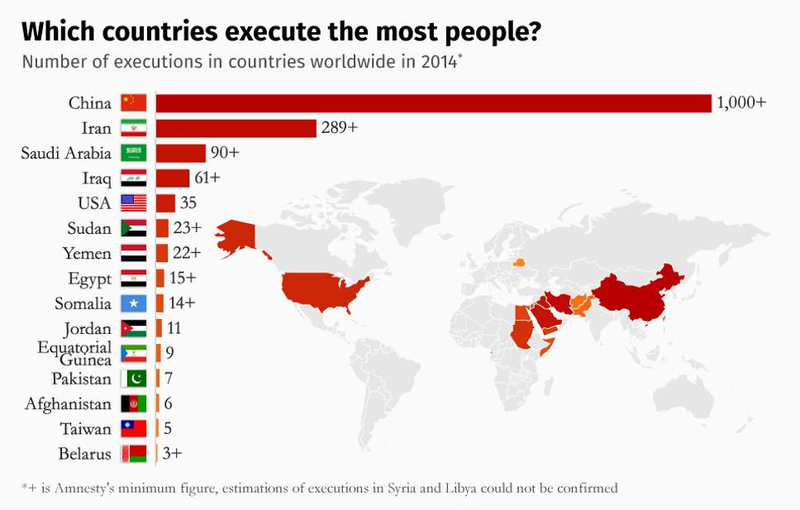 The data in jurisdictions that have the death penalty have been unable to show that it has deterred such crimes to any reasonable degree. It is simply not a solution to the problems we face. Yet there are many more reasons not to employ the death penalty. For one thing, it denies citizens the due process of law, as the death penalty is the ultimate penalty that cannot be revoked. It does not allow the accused the opportunity to benefit from new forensic techniques or collection of evidence which would allow for the reversal of a conviction. And it is quite barbaric. We don’t punish those convicted of assault by assaulting them, so why should we kill killers? If it is to be used as a deterrent, is it morally justifiable to use one citizen’s life to deter other crimes they did not themselves commit? Due to these reasons some people seem to think that opposing the death penalty implies a lack of sympathy for the victims, but the opposite is true. Rarely do the families of murder victims feel that another murder would make them feel better. Murder demonstrates a lack of respect for human life. Life is precious, and death is irrevocable, which makes murder abhorrent, and which should make state-authorized killing even more abominable. For as Gandalf said to Frodo, “Many that live deserve death. And some that die deserve life. Can you give it to them? Then do not be too eager to deal out death in judgment. For even the very wise cannot see all ends.